A plethora of combat weapons including assault rifle, mini-mines, plasma grenades and more. Genetically engineered to be immune to all forms of chemical and biological attack. Rogue was a genetically-engineered warrior, bred to fight in the galaxy's deadliest war-zones. But the G.I. 's brothers-in-arms were ambushed at the Quartz Zone Massacre, betrayed by one of their own generals. 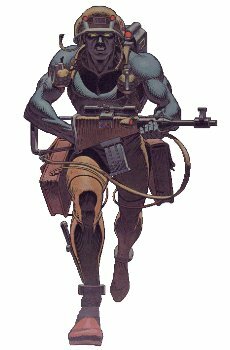 The only survivor, Rogue went A.W.O.L, vowing to hunt down the traitor general and bring him to justice. The digitised souls of former brothers-in-arms Gunnar (situated in Rogue's gun), Helm (in Rogue's helmet), and Bagman (in Rogue's backpack). The trio are preserved as bio-chips to aid their fellow G.I.s in combat.